← Action: Stop #SCOTUS Nomination – Save Roe, Save America! Charlotte NOW President Melba Smith Evans had the opportunity to attend a cocktail reception in support of ratifying the ERA in NC. 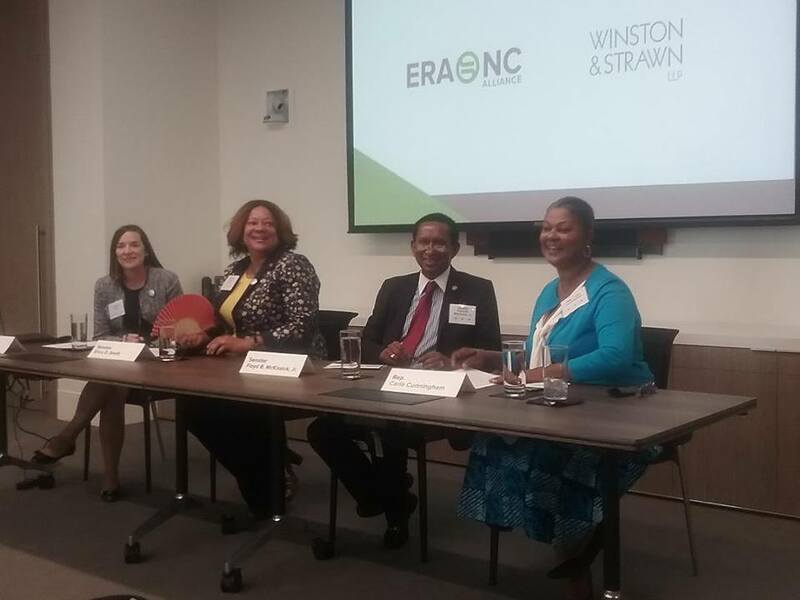 This event was hosted by Winston & Strawn, LLC, at their office in Charlotte, on 7/12/18. The program included a panel discussion featuring ERA bill sponsors and a lawyer from the law firm. The panel addressed the status of ratification efforts in North Carolina, the practical and legal implications of the ERA, and how individuals can become involved. ERA-NC members and member organizations of the ERA-NC Alliance were invited (like NC NOW, BPW-NC, and more). The ERA was ratified by Nevada last year (3/21/17) and by Illinois this year (5/30/18) and following the three-state strategy, we now need only one more state to ratify the ERA. Senator Floyd McKissick, Jr., Representative Carla Cunningham and Senator Erica D. Smith gave updates and information in regard to passing the ERA in NC. Lawyer Joanna Wade talked about the legal value of the ERA. The ERA inspired many to attend this event! Photo Credit: Sen. Floyd McKissick, Jr.
Bills supporting North Carolina’s ratification of the Equal Rights Amendment were introduced in both houses of the North Carolina General Assembly in 2015 and again in 2017. In 2017, Senator Floyd McKissick, Jr., introduced SB 85 and Representative Carla Cunningham introduced HB 102. Both bills have multiple co-sponsors, but have been left sitting in their respective #NCGA Rules Committees (one in Senate Rules, one in House Rules). So either way we are covered. You may remember Rep. Cunningham from 2015 when she stepped up to sponsor the ERA bill from the NC House. Read more at Fearless Carla Cunningham and Introduction of ERA in NC, 2/26/15, http://www.northcarolinanow.org. This picture includes ERA-NC Alliance Co-Presidents – Marena Groll (far left) and Roberta Madden (green shirt), Senator Erica Smith (yellow shirt), Senator Floyd McKissick (man with tie) and Rep. Carla Cunningham (in blue/white), Charlotte NOW President Melba Evans (in purple shirt), and ERA-NC board member Sherry MacQueen (last on right). Thanks to Melba Evans for the original facebook post and the great pictures!